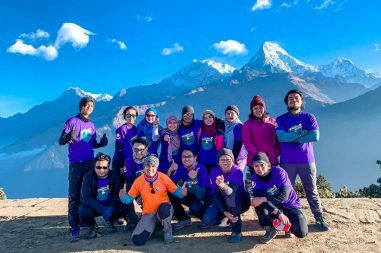 Annapurna Base Camp Trek 13 Days is a fantastic journey one must not miss. This offers you the whole mountain ranges. Especially, the magnificent, colossal, and snow-capped that are against the blue sky. 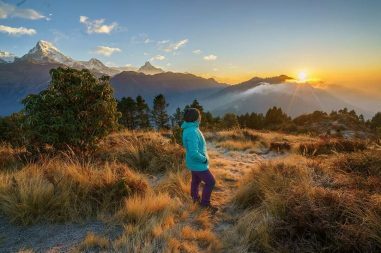 You can also observe Annapurna South, Tent Peak, Hiunchuli, Gangapurna, and Annapurna South. Their beauty is indescribable that they draw Everyone’s attention. You can take their photos with your camera as much as you like and as far as you can reach to the corners of the base camp. The trek begins from Nayapul starting point. From here, you cover a large distance of stone steps up to Ulleri. Its often said there are 3300 steps in Ulleri. It leads to the emergence of the region which is made of the uphill trail, steel suspension bridges, and frequent bamboo forest. This includes the largest rhododendron forest in Nepal. In addition to these, after a decent hike from Ghorepani, you will reach Poonhill. 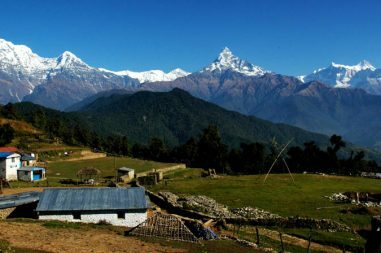 Poonhill affords the brilliant view of both Dhaulagiri Ranges and Annapurna Ranges. You will also see Fishtail Mountain as well as, the mountain ranges bathing in sunlight. Off all the villages the journey takes you to, Sinuwa village is calm, peaceful, and scenic. 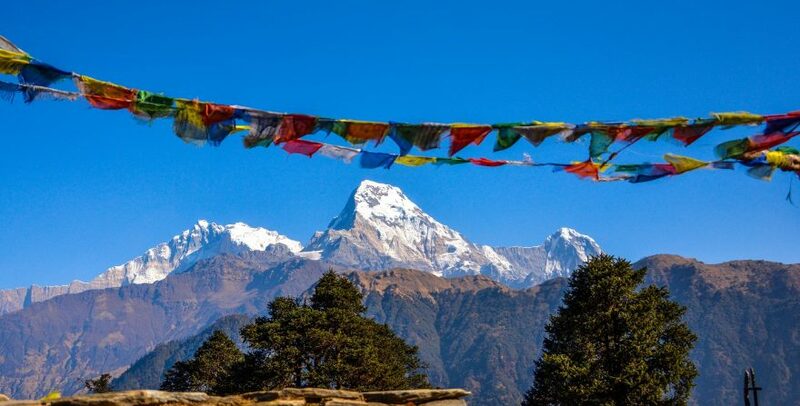 Its background mountains include Fishtail and Gangapurna. 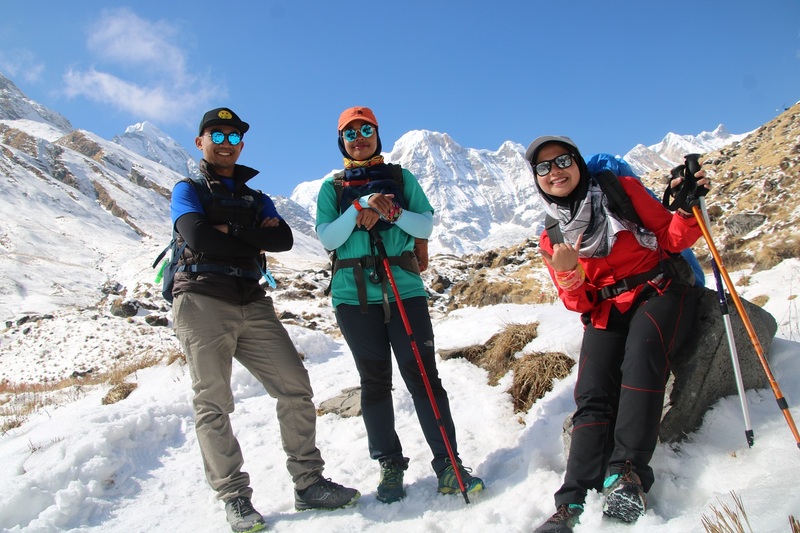 We know trekking is tiring, and we also know that trekking offers breathtaking views; therefore, we all want you to rest overnight at Jhinu Danda, By walking 20 mins downhill from Jhinu Danda, you will reach Jhinu Hot Spring. This will boost your tired body for the last trekking day of Annapurna Base Camp. We Bharal Adventure assure you the best hospitality and quality services. Day 07 - Hiking up to Deurali 5hr (3200m). Our airport representative will be receiving you at Tribhuvan International Airport, Kathmandu and s/he will be displaying a Bharal Adventure signboard outside the airport terminal. You will be then transferred to your respective hotel in our private tourist vehicle. This day We will have a scenic drive to Nayapul in Private Car/Jeep which takes around 1 hr 30 min. 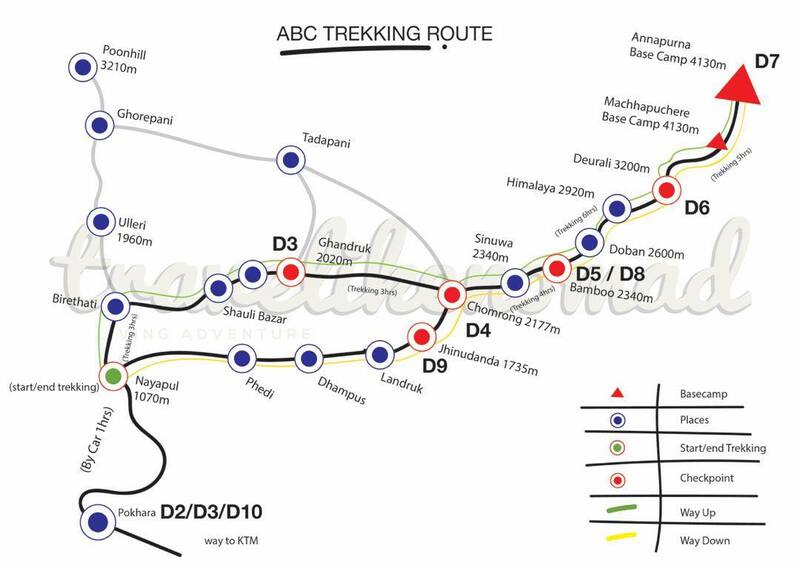 Than We will begin our Trek from Nayapul. After a short 20-minute walk along the banks of the Modi Khola, we reach Birethanti (1,015 m), a large village with many shops and teahouses. From there, the trail continues through the village and follows the north bank of the Bhurungdi Khola. The trail climbs steadily up the side of the valley to Hille at 1,450 m.
The following gives you a general idea of the trekking equipment and clothing needed for this trek. This is a porter-supported trek. Two clients share one porter. We will supply you a trek duffel bag where you keep your heavy items and this bag is carried by the porter. You will need to bring your own daypack to be carried by you. In the daypack, you can put money, important documents, water bottle/bladder, camera, toiletries, sunscreen, notebook, etc. This list is only a guide. While you are required to bring everything on this list, there are numerous options, brands, and versions of each piece of equipment. Use your experience and the listed features to find the best gear for you. Some of the above equipment can be easily found in stores in Kathmandu for cheaper prices.